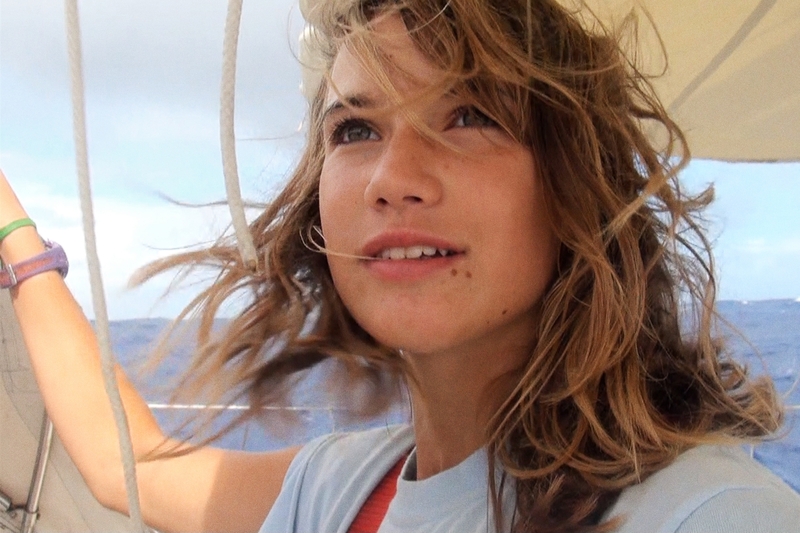 Laura Dekker wants to sail around the world. 519 Days, 27,000 nautical miles. No support crew, no follow boat. Just her. Maidentrip follows this young woman as she realizes one of her greatest dreams to circumnavigate the globe on her own, not to beat any records, not for glory… she just wants to see the world beyond the Netherlands. After a legal battle with the Danish courts about whether or not she should be allowed to do this, whether it was child endangerment or poor parenting, the courts, quite rightly, left the decision with Laura and her father. He believed in her enough to let her go, to let her chase her dream. And that is exactly what she does, leaving from Gibraltar, on the Guppy, a ship her father and she have refurbished and kitted out for her voyage, chasing her dream. With supplies, maps, music, books, and camera, she goes to take on the wide world, to see sights she’s never imagined, to meet fellow sailors, to live, and to revel in the solitude provided by the ocean. From the Canary Islands to St. Maarten’s, through the Panama Canal to French Polynesia, from Darwin, Australia around the Cape of South Africa, we journey with her through storms, becalmed seas, enjoying the wildlife she encounters, fellow travellers and the sights she sees. We also watch this young woman grow. Already an accomplished sailor before she leaves, she is the stuff of legend by the time she has finished, transitioning from your wide-eyed girl to a fearless traveller, weathered by the elements and her experiences. Schlesinger with Laura’s invaluable recordings, both video and audio, give us a rites of passage story set against some of the most beautiful imagery on the planet, open oceans, dizzying tropical paradises, and fellow human beings. Enjoying her privacy and her solitude, Laura is most at home on the water, with the spirit of an explorer she chases the horizon. She keeps her calm in horrendous storms and 60 foot waves, she maintains her sanity after two weeks on a becalmed Indian Ocean with nary a breeze to fill Guppy’s sails. This film offers a welcome glimpse into the adventure that was undertaken, I say glimpse because for all that time out there, almost 2 years, she shot a grand total of 10 hours of footage. Hearing that in the Q&A afterwards I was just struck by how much time she was by herself, with only the occasional dolphin, sea-bird, land fall and fellow sailors to interrupt the loneliness. How did she spend the rest of her time? I get that sailing takes a large portion of it, but I was struck with thoughts like, what did she read (she took lots of books with her), what songs would she play in the middle of the night with nothing but the whales for company? Did she get tired of certain foods? What were the stars like on those nights when you seemed to be the only person in the entire world? Films like this always kindle a sense of longing and adventure in me. It’s a beautiful film, and I look forward to hearing more about Laura’s travels and adventures. Maidentrip screens again on Tuesday April 30 at 1:30pm at Scotibank and Sunday May 5 at 7pm at the Light box. You can find their Facebook page here and on Twitter here. Set your sails!